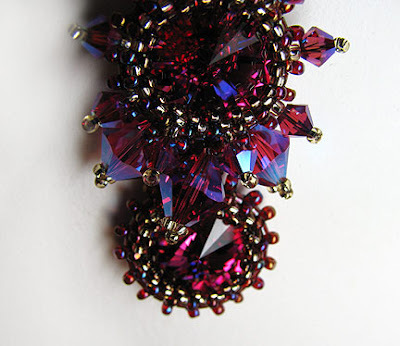 I bought a pair of beautiful 14mm fuchsia Swarovski rivolis from Rings&Things recently, and have been mulling over how to use them ever since. Finally, I gathered together some 4mm and 8mm Swarovski bicones, along with some beautiful seed beads, and got working! 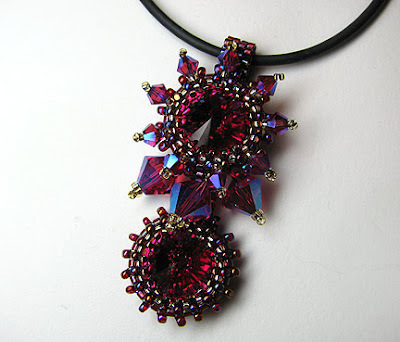 As you know, I most often turn to bead embroidery to make pendants and necklaces, but this time I thought it might be fun to use bead weaving instead. The bezels for rivolis stitch up fast. I've included the exact numbers of beads that I used, but you may find your count differs depending upon exactly what beads you use and how tight your tension is. 1. Work the bottom part of the rivoli bezel first. 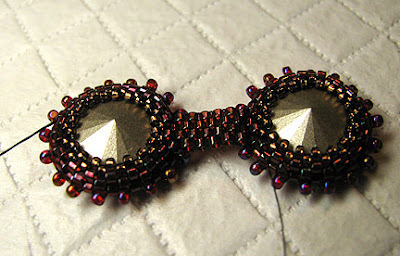 I used 36 size 11/0 Delicas to form the first two rows of peyote stitch. 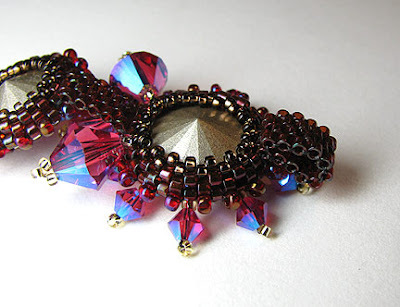 Stitch one row, using the same beads, and then add a couple rows of size 15/0 Rocailles to cinch in the bottom. Depending upon what beads you choose and how tight your tension is, adjust the bead count, but make sure you work with an even number in each row. When you finish the bottom of the bezel, work the thread up to the top row. 2. With the rivoli in place, work the top part of the bezel. 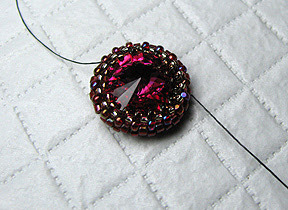 I used a row of size 11/0 Czech seed beads, followed by two rows of size 15/0 Rocailles. Again, your personal choices and tension will determine how many rows you need in order to secure your rivoli. Add some embellishment beads or picots around the middle row if you like. 3. Bezel another rivoli the same way and join the two with a peyote strip attached just beneath the middle row. 4. Embellish one of the rivoli bezels with Swarovski crystals. I used 3 8mm bicones in the middle row, and 9 4mm bicones in the row just above the middle. 5. 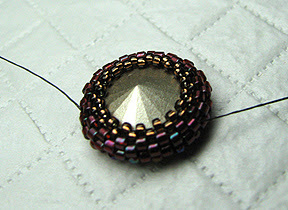 On the back of the top bezel, stitch a peyote strip (4 to 6 beads wide) long enough to encircle a pendant cord. Wrap it around and zip the last row to the first. ouahhhh!! !je l'adore! merci pour ce tuto! Beautiful pairs of 14mm fuchsia Swarovski rivolis. Its delightful and attractive. Köszönöm, ezt a gyönyörű mintát! 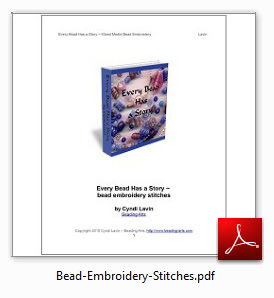 Cyndi, thanks for sharing your great tutorial, I like the color scheme + your neat design! It's sooo elegant! Thanks for sharing the technique. Wow Cyndi, you make it look so simple, and the results look so very astounding! Beautiful! That's so gorgeous. I love the colors you chose.